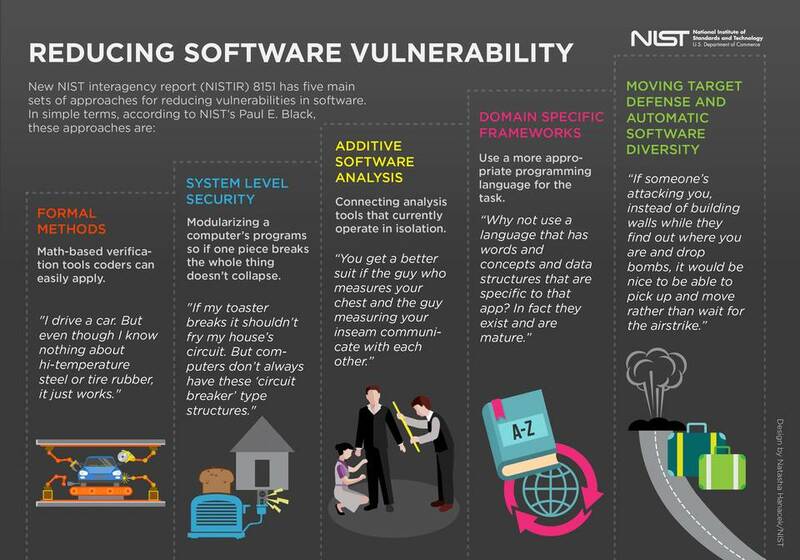 The National Institute of Standards and Technology (NIST) has completed its long-running research into cutting software vulnerabilities and dropped the big envelope into the White House letterbox. NISTIR 8151, Dramatically Reducing Software Vulnerabilities, first landed as a draft in July, and the final version dropped last week (PDF). The document's brief was to look at approaches new to the software industry, and seek technical improvements to software development that could have a “dramatic” effect on software quality (for example, cutting the typical 25 errors per 1,000 lines of code by an order of magnitude); and could be achieved in a three-to-seven year timeframe. Math-based tools are needed to verify code operation, the report says, and developers should modularise the code sufficiently so it doesn't crash just because one component fails (Vulture South knows this is obvious, but just how many vulnerabilities happen when you crash a process and get to root? ).